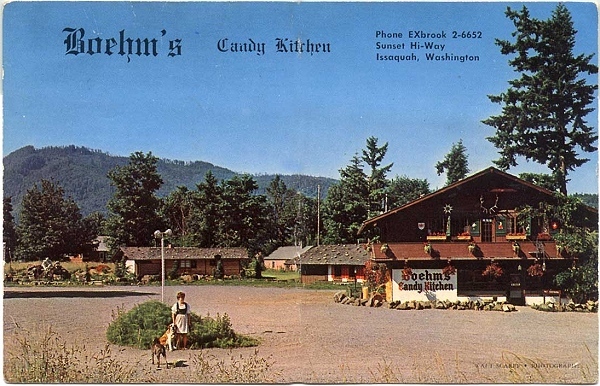 Located in downtown Issaquah in an authentic Alpine Chalet, Boehm’s Candies, Inc. has a history as unique as any of the one hundred and fifty types of chocolate and other confectionaries manufactured on its premises. Even more remarkably, the shop still operates with many of the traditions and principles instilled by its founder Julius Boehm (1897-1981) over sixty years ago. Boehm, a Vienna-born honored athlete and grandson of a candy maker, fled Austria to Switzerland in 1939 to escape Hitlerís forces by using his knowledge and prowess of the often treacherous mountain ranges. He immigrated to the Pacific Northwest just one year later. In 1943 he opened his first candy kitchen with his friend George Tedlock in the north end of Seattle, where the business met significant success. But Boehm was drawn to the Issaquah Alps, whose heights and greenery strongly resembled his homeland terrain. 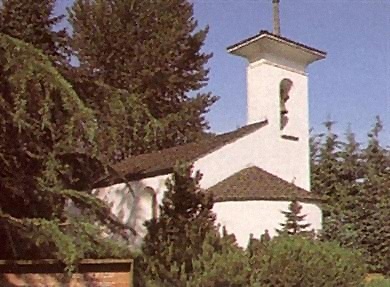 In 1956 he moved the company to the Issaquah foothills, where he constructed the two distinctive buildings which still attract town residents and tourists alike: the Edelweiss Chalet, where the retail store and candy manufacturing plant reside, and the Alpine Chapel, a stunningly ornate tribute to mountain climbers. The chalet also includes a second story apartment where Boehm lived during periods of his life. Boehm became known not only for the quality of his candies but also as a generous and active member of the Issaquah community and a strong advocate of his many passions, which included skiing, hiking, mountain climbing, and music. To recognize his contributions, the City of Issaquah proclaimed August 15, 1978 as Julius Boehm Day. Just a short time later, King Country parks system named the district swimming pool in downtown Issaquah in his honor. As his final legacy, Boehm set up a corporation that put his company operations under ownership of several close friends and employees after his death. The company — including many long-time employees — continues to create the Boehm line of confectionaries using its time-honored manufacturing methods. Amazingly, it is one of three candy kitchens in the entire country which still hand-dips its own chocolate. 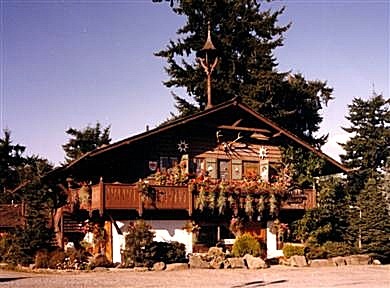 The “Edelweiss Chalet”, constructed in 1956, was the first Swiss chalet built in the Pacific Northwest. The original building was designed and built by John Blomberg, a former employee of Boehm’s Candy Kitchen on Ravenna and a friend of Julius Boehm. 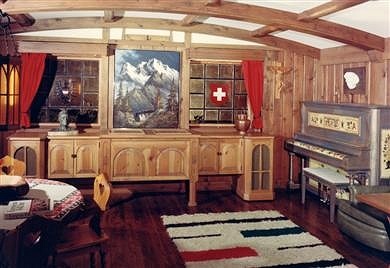 Swiss woodworker Walter Shefer, from Alpenzell, Switzerland designed the woodwork and other Swiss elements to give it the Chalet appearance1. The chalet is named for the native flower of Switzerland. At ground level is the candy factory and storefront. The second story contains the wood-lined apartment, with most of the original furnishings and dÈcor, where Julius Boehm resided. In 1982, the Chapel section opened. It was also designed by Schefer. Construction began as early as 1980 2. According to the Issaquah Press, the chapel was built to honor mountaineers. 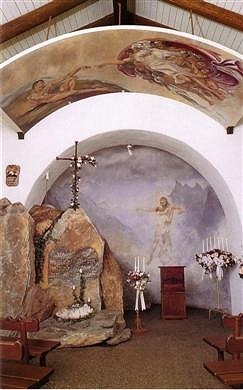 The chapel is a replica of a Twelfth Century chapel near Saint Moritz Switzerland. The chapel interior seats fifty people and is lavishly decorated. A recreation of Michelangelo’s Creation of Man is suspended from the ceiling and an elaborate mural of a fallen mountaineer lines the northern wall. By reservation only, Boehm’s allows use of the chapel for weddings: an estimated three hundred couples a year use if for their ceremony site. 1 E-mail from Diane Camp, 2/16/2006. 2 Issaquah Press, October 15, 1980, page 2.